HARLEM — For a second time in three years, Naima Williams is the best bartender north of 110th Street. 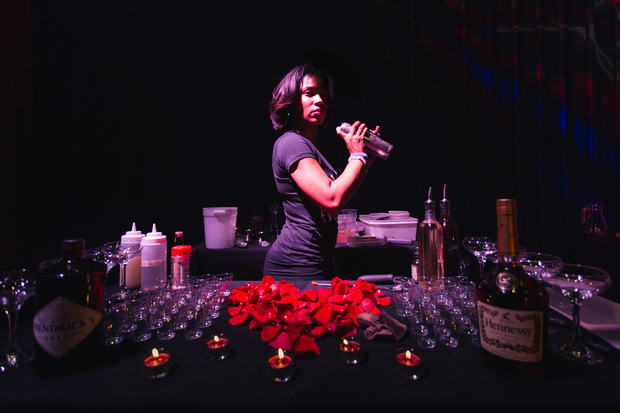 The barkeep/manager of Angel of Harlem out-poured her competitors during the “Uptown Battle of the Bars” competition at MIST Harlem on Wednesday night. Bartenders from more than 30 bars throughout Harlem, Washington Heights, the Bronx and East Harlem competed for the title. During the showdown, 12 finalists competed in a three-round head-to-head matchup that featured a consistency round where they had to pour 300 1-ounce drinks, a speed round where they had to make six drinks in three minutes, and a mystery ingredient round where they had to create a custom cocktail on the spot. After Williams won the competition in 2013 she decided to take a break from bartending and got a 9-to-5 job in healthcare. But she couldn’t stay away for long. When Anahi Angelone and Eimear Conway opened Angel of Harlem on Frederick Douglass Boulevard, they knew exactly who to bring in to create their cocktail menu. Williams, who started off the competition by pouring 300 aphrodisiac cocktails, is currently helping the restaurant create their winter cocktail menu, Conway added. When Williams got back behind the bar she knew the annual competition was a few months away and began preparing, she said. In previous years, the event has been held at Harlem Tavern. But because of the event’s popularity, they decided to move it to a bigger venue, Evan-Hendricks said. Winning the title of best bartender has been even sweeter the second time around, Williams said. It reaffirms her hard work and shows other women of color they belong in the industry, Williams said.